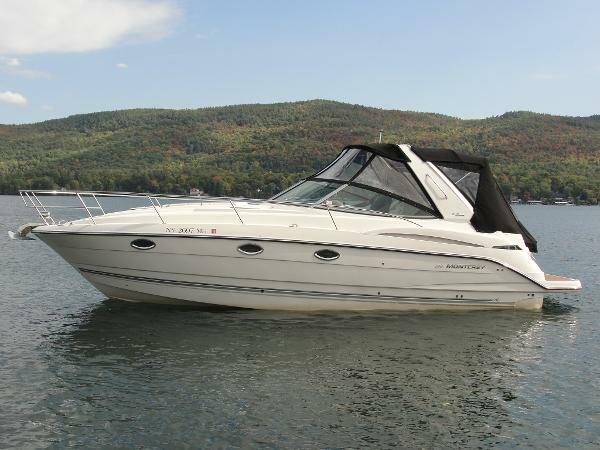 2009 Monterey 340 Sport Yacht LUXURY - COMFORT - PERFORMANCE - THIS YACHT HAS ALL 3! BEAUTIFUL LEATHER INTERIOR, HARD SURFACE COUNTERTOPS, SYNTHETIC WOOD FLOORING AND VERY WELL EQUIPPED. POWERED BY TWIN VOLVO 5.7gxi ENGINES WITH DPS-A DUO PROP DRIVES. 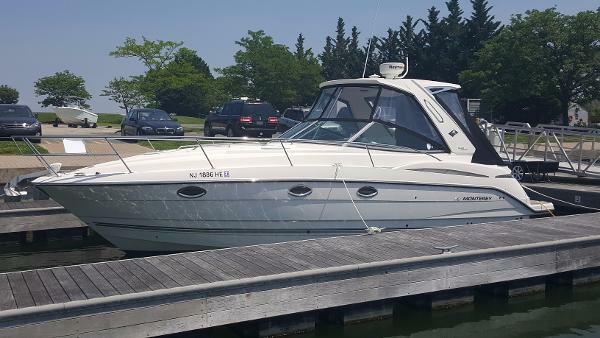 UNDER 220 HOURS ON THIS GORGEOUS SPORT YACHT BOTTOM PAINT FALL 2015********** MAINTENANCE JANUARY 2016 INCLUDED: FULL ANNUAL SERVICE WITH IMPELLERS ENGINE TUNE UPS NEW EXHAUST BELLOWS ****** NEW U-JOINT BELLOWS NEW SHIFT CABLES NEW TRIM SENDERS ALIGNMENT CHECKED AND VERIFIED GOOD DRIVE SERVICE GENERATOR -- COLD AC -- HEAT -- VACUFLUSH HEAD -- 2 REFRIDGERATORS -- 2 TVs ALL THE ELECTRONICS INCLUDED. PRICED TO SELL AND FUN TO SHOW. CALL FOR AN APPOINTMENT TODAY! 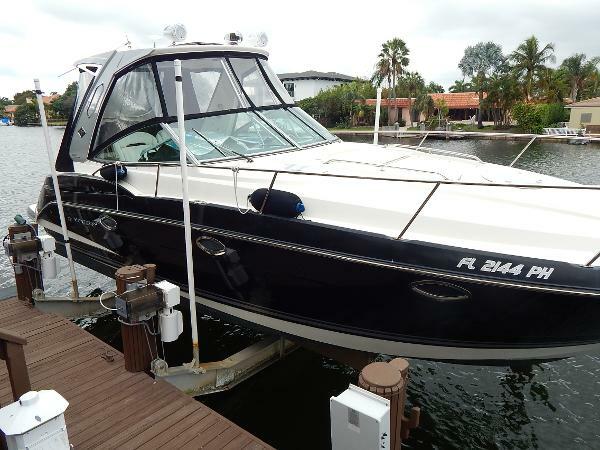 2009 Monterey 340 Sport Yacht This Monterey 34 Sport Yacht is a one-owner boat that shows in near-perfect condition. New to the market– this one wont last long. Call today! 2013 Monterey 340 Sport Yacht PRICE REDUCED Twin Merc 377 MAG MPI (320 hp) with Axius joystick docking system Bravo III with SS Props and 51 Hrs, Gel Stripe, Remote Controlled Spotlight, Seadek Swim Platform Inlay (Brown), Hardtop Exterior , Under Water LED Lights, Cockpit Refrigerator, Elec Pkg A - Ray Marine E90W VHF & GPS/Chartplotter & Radar, Stereo Upgrade Pkg (Includes Wet Sounds Speakers, 3 flsat screen tv's,underwaterlights added also,Sub woofer, Fusion Amp and 2 Additional Speakers in Cockpit), Woven Cockpit Carpet & Woven Interior Runners Lay-Down, Cockpit Air 16000 BTU, Generator 5.0KW Gas w/Sound Shield (Low Emission), Macerator w/Overboard Discharge The 340 Sport Yacht is one Monterey’s most popular models. The right mix of its sleek design and well laid out accommodations make this a winning combination. Equipped with Monterey’s exclusive Sun Island seating, you have three different options on how to relax and spend your day. Beneath the sun island is a finished fiberglass luggage compartment that is large enough for all your lines, fenders, and power cords. On the underneath side of the lid is a dedicated holder for securely stowing the cockpit table.This is in excellent condition and was used as a day boat the few times it was used.Boat is detailed and ready to go.Please call for more info!!!! 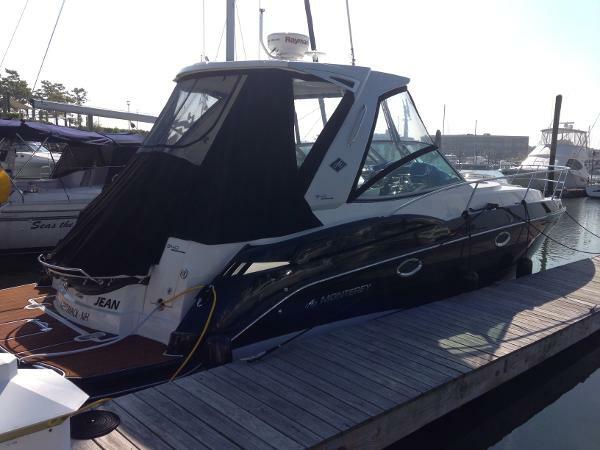 2014 Monterey 340 Sport Yacht MUST SELL!!!! 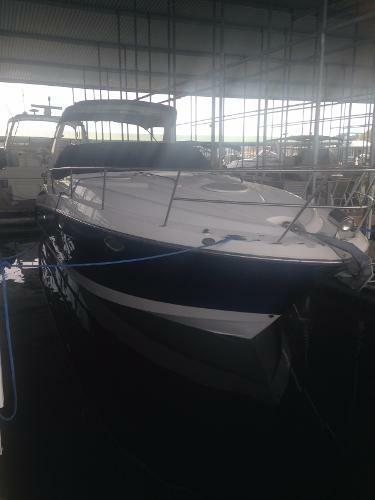 LIKE NEW 340 MONTEREY UNDER FULL FACTORY WARRANTY! Only 35 hours on twin Mercruiser Axius 5.7L MAG 300HP motors with joystick operating system and skyhook! 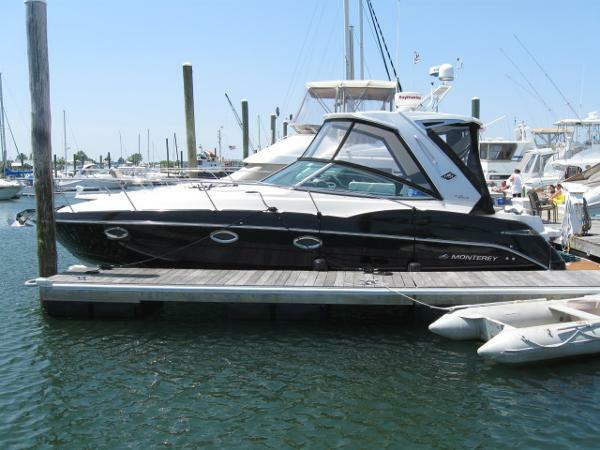 Black hull, hardtop with full enclosure, cockpit TV, cockpit frig, Raymarine GPS/Chart plotter with radar, VHF radio, wood cabin flooring, faux teak swim platform, LOADED BOAT WITH EVERY MONTEREY OPTION, OWNERS CHANGE OF PLANS MAKE THIS A UNIQUE OPPORTUNITY! 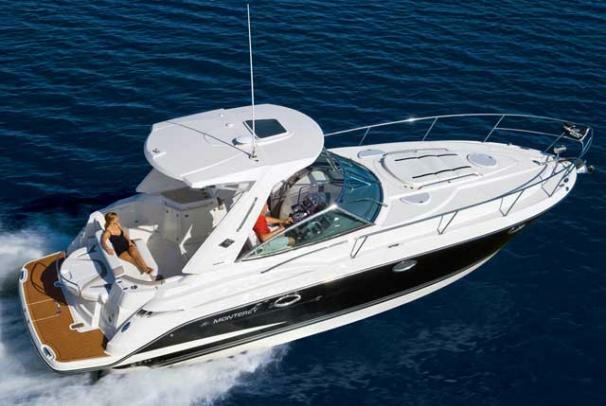 2013 Monterey 340 Sport Yacht Monterey's 340 Sport Yacht is extremely impressive. She is well equipped with the latest technology in engines, with Mercruiser Axius Joystick with her Twin 350 MAG engines. The head room in the cockpit gives a very spacious feeling. Similarly the openness and head room in the cabin makes you feel like you are in a much larger vessel. She sleeps 6 comfortably below and offers a great cockpit for cruising.The boat is in great condition and has been professionally maintained. The engines have less than 70 hrs on them. Mercruiser SeaCore system, AC\Heat, generator, GPS, and VHF. 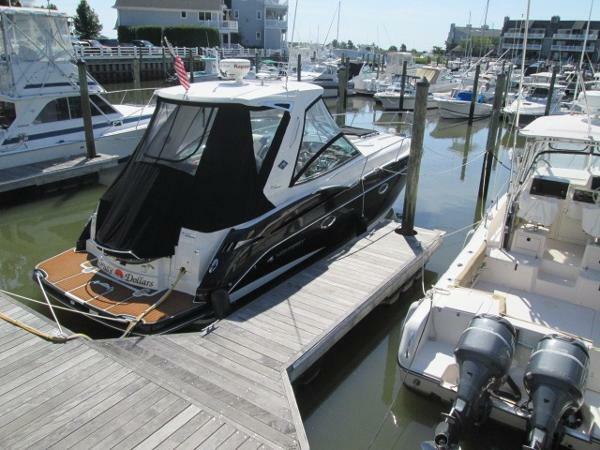 2011 Monterey 340 Sport Yacht Just reduced $20,000.00! Owner says bring all offers! 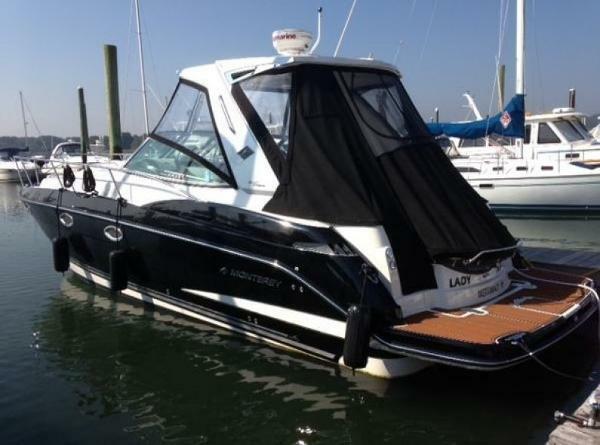 Here's a perfect 340 Sport Yacht with less than 100 hours for 100k under a new one! Tid Bit III has all the toys including the proper drives (not XDP), Joy Stick, Hard Top, Upgraded Stereo w/2 Amps, Genuine Teak Inlay on Swim Platform (not Flexi Teak), Full Electronics Package incl Radar, GPS and VHF. Other options include Electric Anchor Windlass, Remote Spotlight, 5.0kw Generator, Air Conditioning and Heat, Underwater Lights, Cockpit Fridge and Cockpit Carpets. The current owner had custom fabrics and Spinneybeck Leather installed by Zack at IK Yacht Interiors for a touch of color and flair (10k). We also retained the original soft goods, which are new. 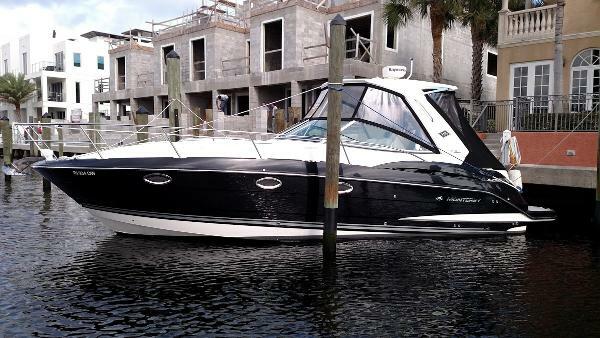 We sold this Monterey 340SY new and have all the records from day one! She is kept on a dry single stack at Rickenbacker Marina on Key Biscayne and is in "as new" condition with flawless Sapphire Blue gel coat. This is a rare find so contact us today! 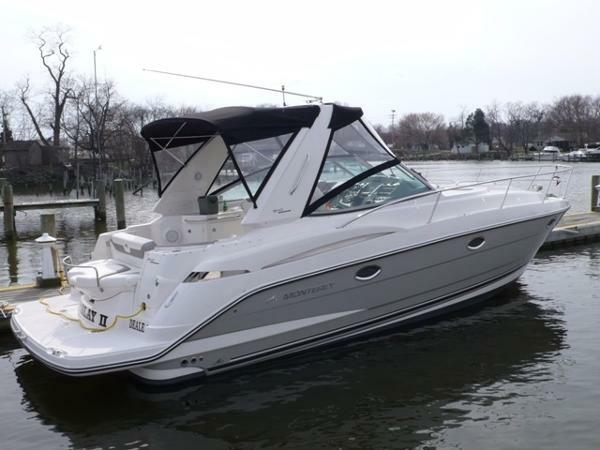 2013 Monterey 340 Sport Yacht Bask in Excellence Owner is relocating. 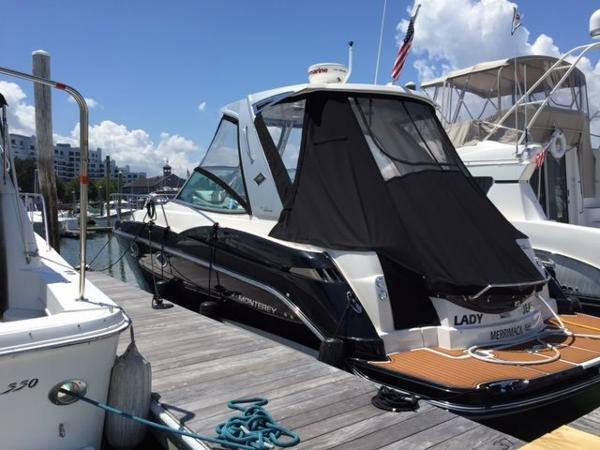 This 2014 340 Sport cruiser has 148 hours on it and cannot be overlooked if you are in the sport cruiser marketThe 340 Sport Yacht is one Monterey's most popular models. The right mix of its sleek design and well laid out accommodations make this a winning combination. Equipped with Monterey's exclusive Sun Island seating, you have three different options on how to relax and spend your day. Beneath the sun island is a finished fiberglass dunnage compartment that is large enough for all your lines, fenders, and power cords. On the underneath side of the lid is a dedicated holder for securely stowing the cockpit table.